At this point, is there anybody who hasn't been floated as a possibility to replace Steven Tyler as the lead singer for Aerosmith? 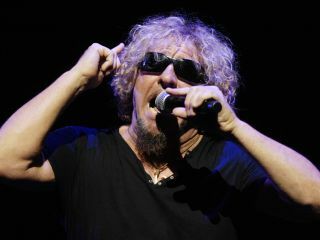 Add one more name to the list: Sammy Hagar. Classic Rock reports that 'a source' got the skinny that the Chickenfoot (and former Montrose/Van Halen) belter had agreed to front the Boston band on a forthcoming world tour. Classic Rock contacted Hagar's manager, John Carter - or Carter, as he is better known - to say that they had it on good authority that Sammy was joining the Beantown rockers. "Good authority must mean The Enquirer because his Led Zep gig conflicts with the Aerosmith job," Carter joked, and then added that Hagar was happy as a clam with his current band Chickenfoot and was looking forward to start recording their second record in April. What everybody's missing here is that there's a TV show in all of this...Oh, wait, they tried that already with INXS a few years ago. Never mind.